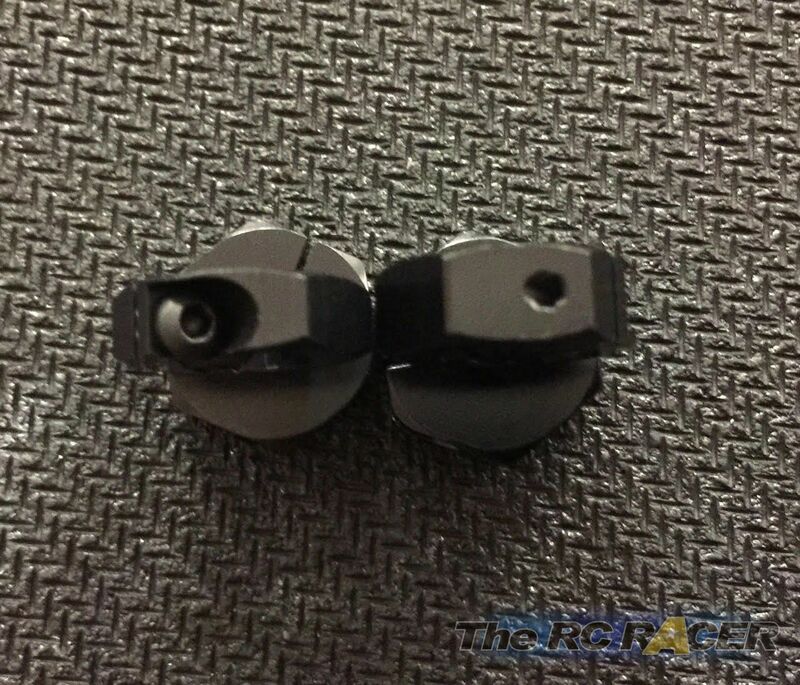 When you look at Xray’s dedicated page on the T4 2018 you will immediately notice the new ULP (Ultra Low Profile) shocks with a 4mm lower design. When you scroll down their website, you will see the evolution of their shocks from 1999 to 2018, and it’s quite impressive what they did with it. 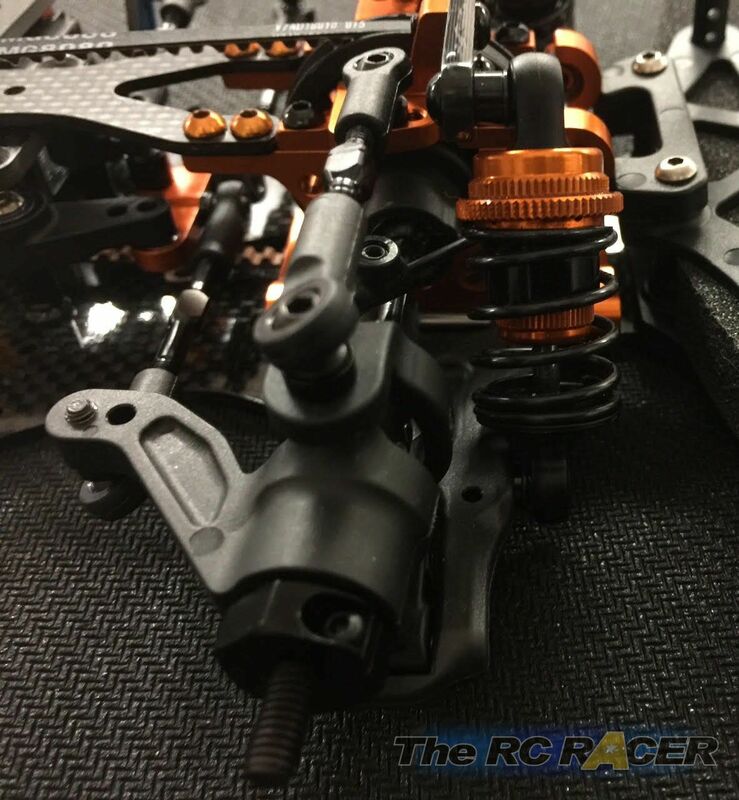 The shock towers have also been lowered in order to fully exploit the potential of the new shocks, with an extra low centre of gravity. 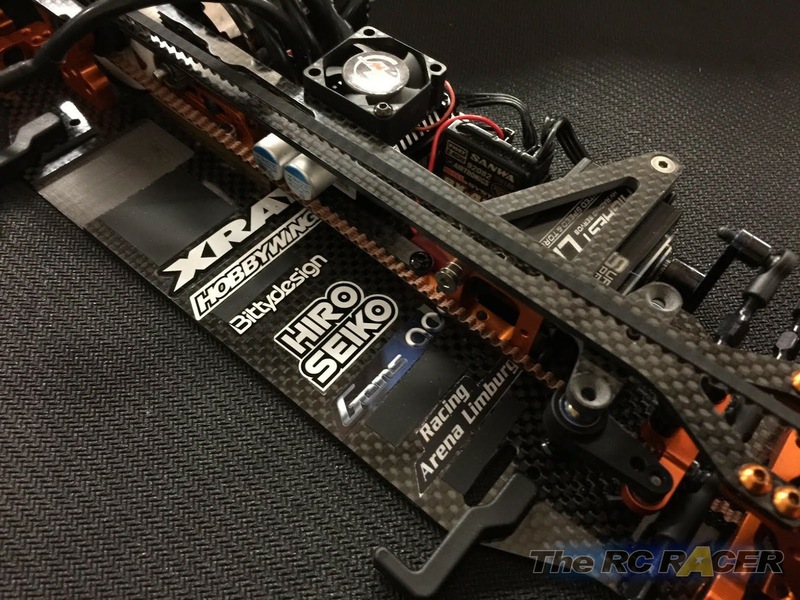 Xray presents their car as a “luxurious racing product”. When you first see the box, you notice the high quality picture of an assembled car with underneath an overview of it’s racing pedigree. You also notice the box is sealed and which employee packed the car. 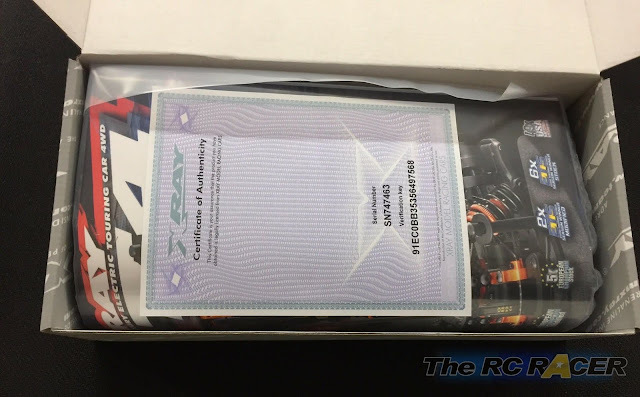 The lineup of Xray cars is one of the few R/C products that is still produced in Europe. Xray uses this fact as token of quality. The certificate of authenticity further proves it is an original product. All the parts are nicely packaged in separate plastic bags, with at each time the name of the employee who packaged the bag. 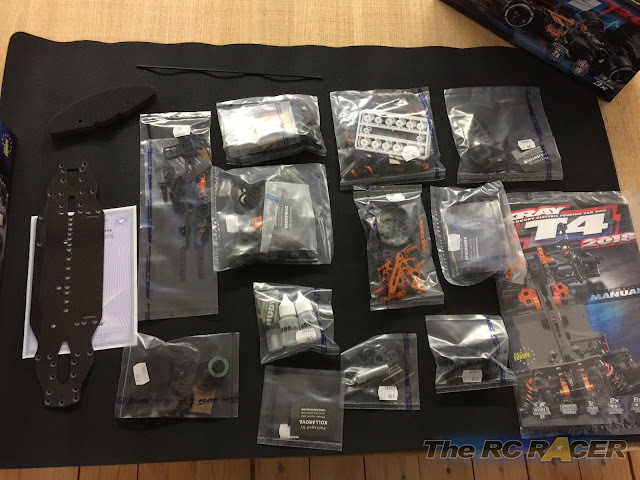 In the kit, you also get all the oils and greases that you need to build it, as well as a bag with spares screws. Included is also an exploded view of the car, which is handy to order spare parts. 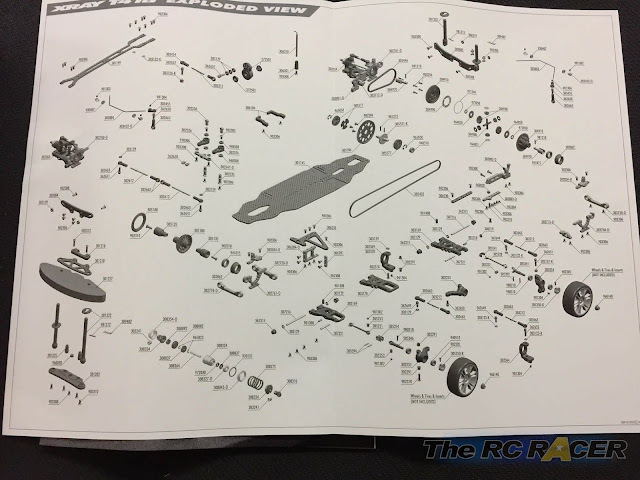 I took a picture of the exploded view in case I need to order parts. 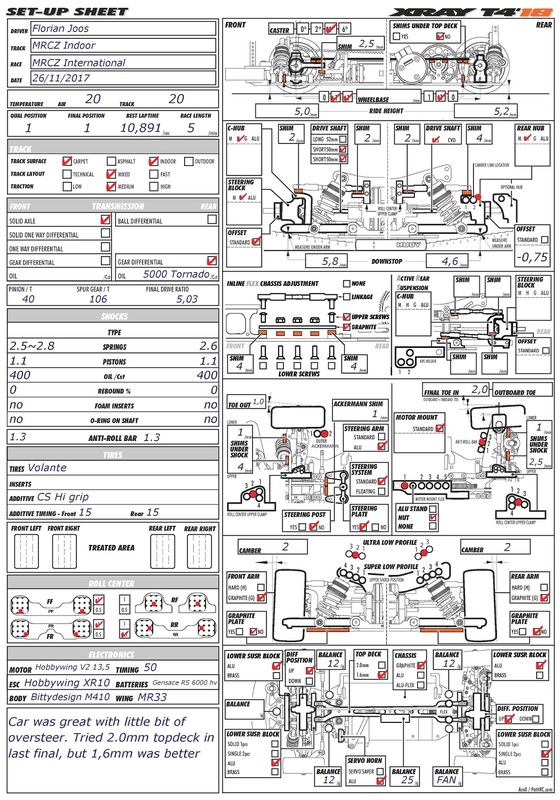 One of the first highlights of the kit is the manual. 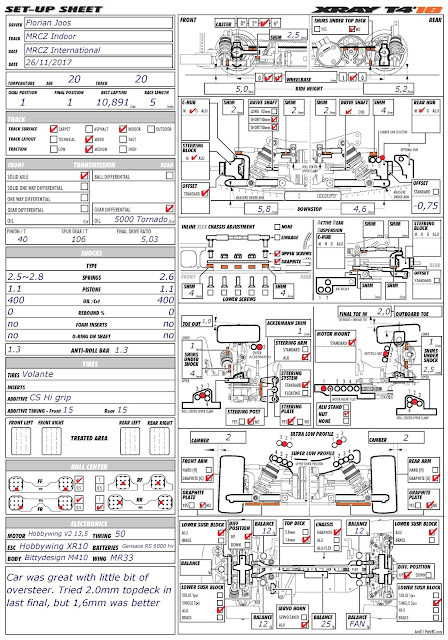 It is printed on high quality glossy full colour paper. 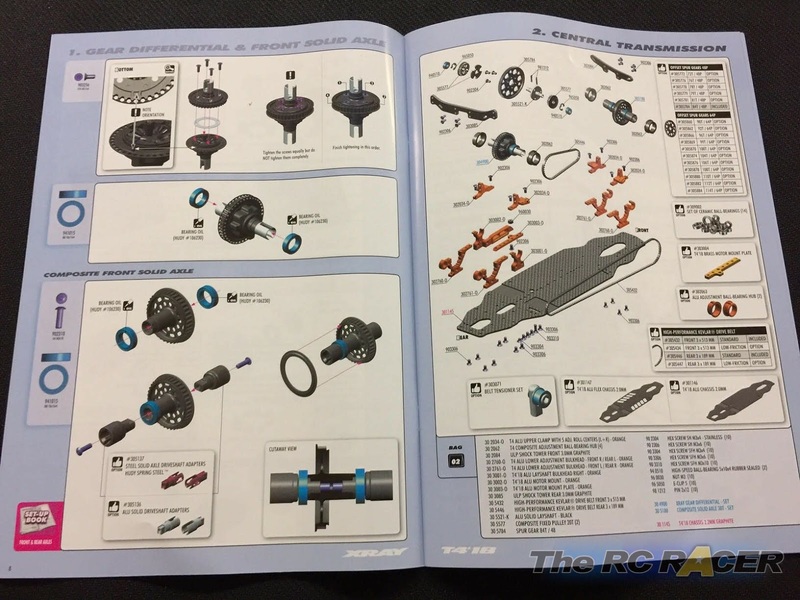 I really liked the manual, not only because it is extremely clear, but also because it mentions the options parts you can use. As is always the case with any car some options can potentially make the car faster while others just have a higher bling factor. Before I started building the kit, I took all the carbon parts out of the bag and sanded the edges with 400 grid sandpaper. I then applied CA glue to the edges which I let to dry. Afterwards I sanded the edges where I previously applied CA again with 400 grid paper and reapplied some CA. Once fully dried I sanded the glued parts again with 2000 grid sandpaper. 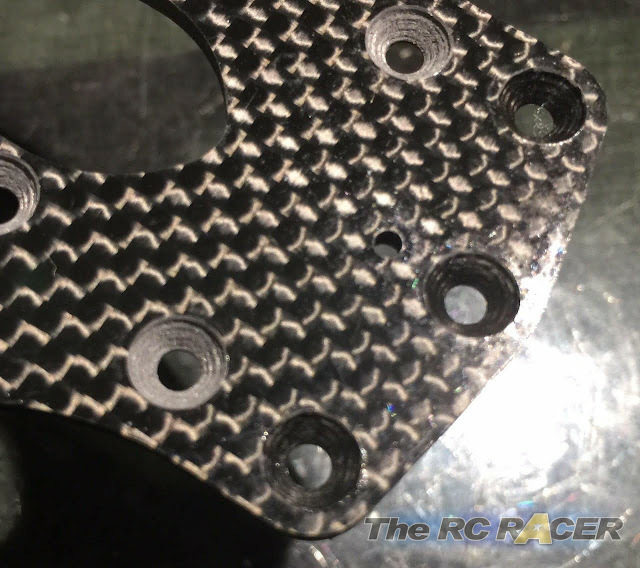 It is a lot of work and hassle, but the carbon parts really look smart when finished. 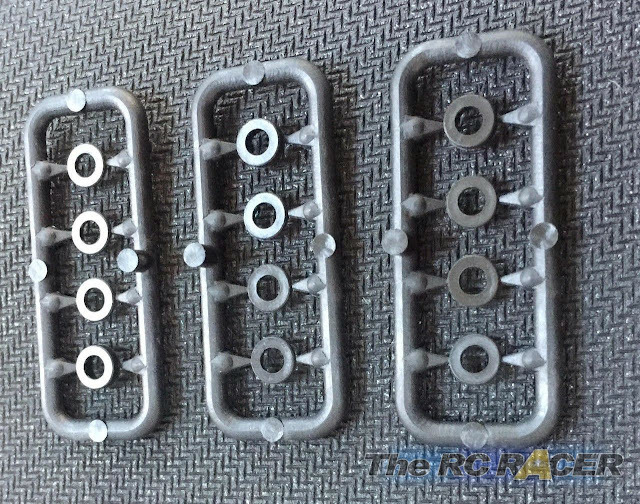 According to the manual, I also applied CA glue to the front and rear countersunk screw holes. I also sanded the slots where the battery tape goes through with 400 grid sandpaper in order to get rid of the sharp edge that might break the battery tape. While I had my sandpaper out, I also sanded the diff gears with 400 and then 2000 grid paper. I then cleaned the gears with brake cleaner, let them dry and then applied some dry fluid grease on the gears. I then dry build the diff and spun it around for 10 minutes or so. It might again be overkill as the quality of the parts is great, but I really wanted to build an extra smooth diff. Someone told me that silicone oil doesn’t lubricate, so I gave this a try. 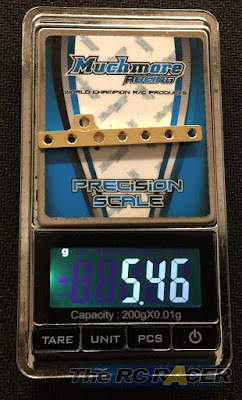 I used the optional brass motor mount plate, because it adds a few grams and does so right at the centre-line of the car. The included ball bearings are blue shielded ones. The advantage of these shields is that you can easily disassemble them for cleaning and thus keep your bearings in shape longer. I normally work quite a lot on bearings before I mount them into a car. Because this is going to be a modified car, I tested them and mounted them. 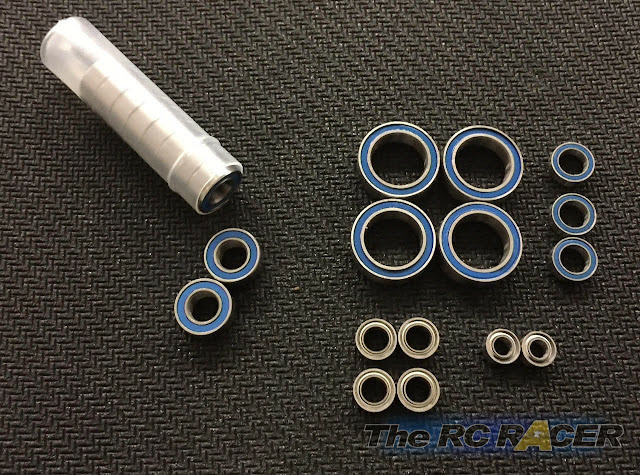 Out of the box, the bearings are lightly oiled and are ok to be used straight away. 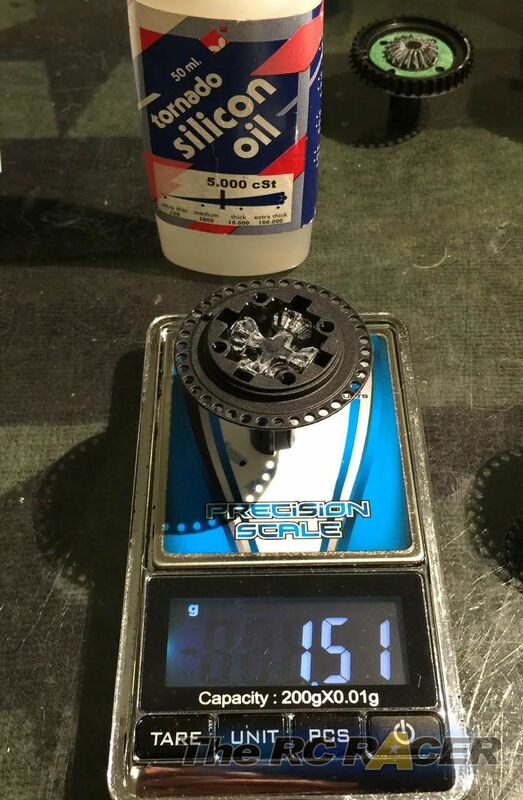 Now with the bearings all checked, it's time to get onto the drive train. The spur mount assembly is simple and I used grease to ensure the pin is held into place. 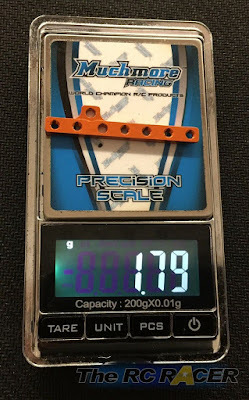 What struck me most when assembling the drive train components is how light these parts are. 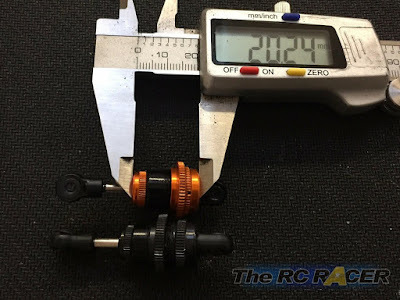 The diff weighs in at around 16 grams, which is a massive 5 grams lighter than the TRF diff. 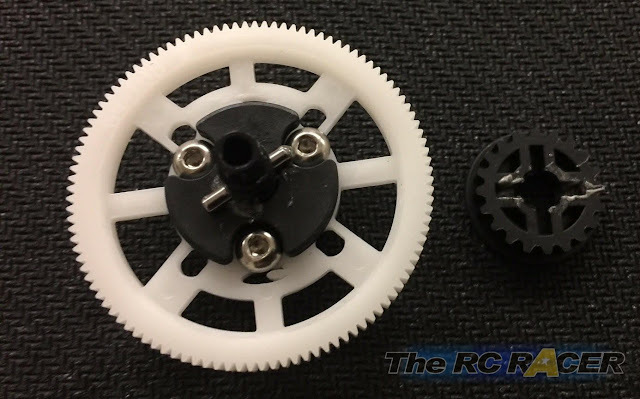 The front spool has plastic outdrives that need to be screwed into the main part. It is quite different from the other cars I've built, but I suppose it is the lightest solution. 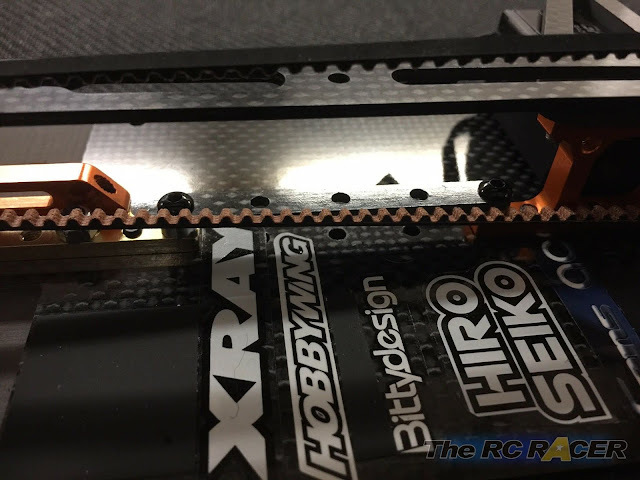 Xray proposes the lightweight white drive belts as an option. This is also what most teamdrivers use, but I decided to mount the original belts. When they are worn, I will replace them with the white belts. 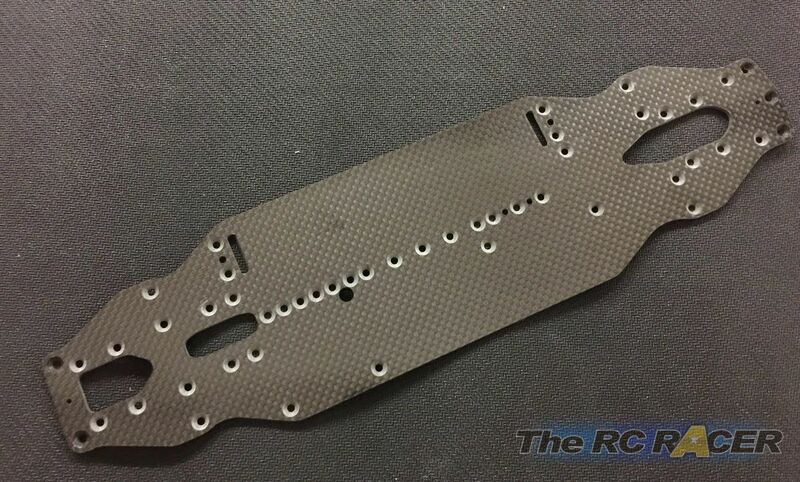 One of the most important innovations for me on the T4 2018 is the motor mount plate. With the number and placing of the screws, you can get more steering or make for a more stable car. If you use the front screws, the car will have a better steering response and more in corner steering. 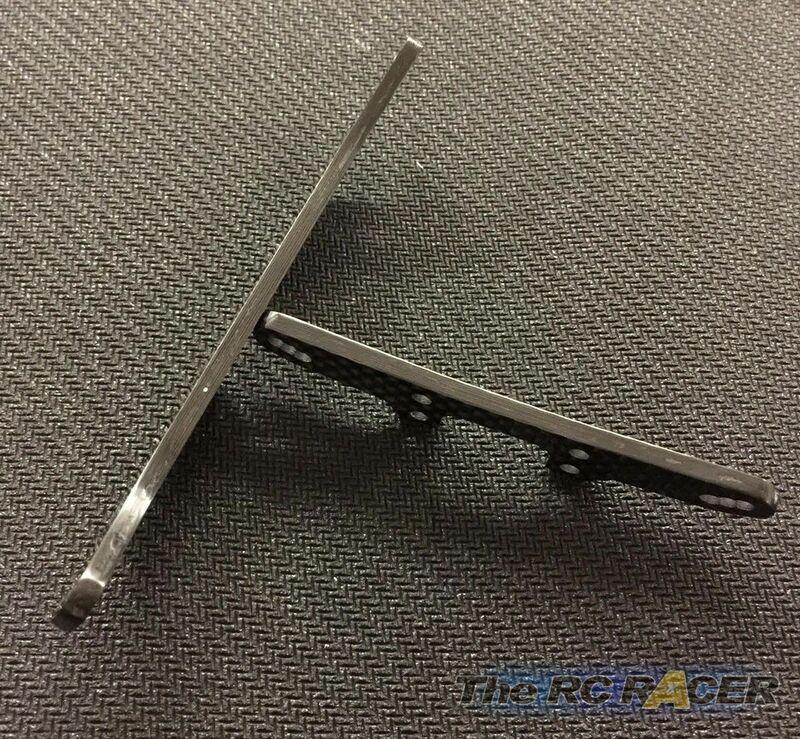 If you use the rear screws, the car will become more stable. With the drive train assembled, now I moved onto the suspension arms. First thing I did was to ream the 3mm holes in the arms with a reamer. It wasn’t really necessary, but I want to make the suspension absolutely bind-free, so I decided to invest a bit more time in the assembly. 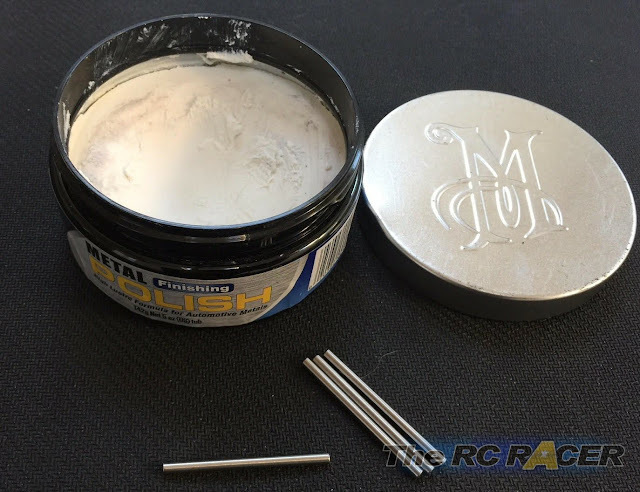 I also polished the suspension pivot pins with Meguiars polish. You can off course use any kind of polish. Polishing the suspension pins will make the suspension move really smoothly. 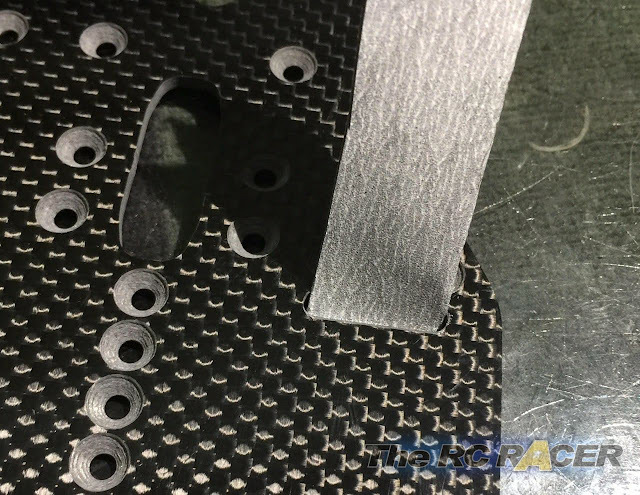 The kit includes composite shims. I’m not really a fan of these, so I replaced them with aluminum ones. In order to set toe, anti squat, kick up, etc, the T4 comes with a lot of eccentric bushings. 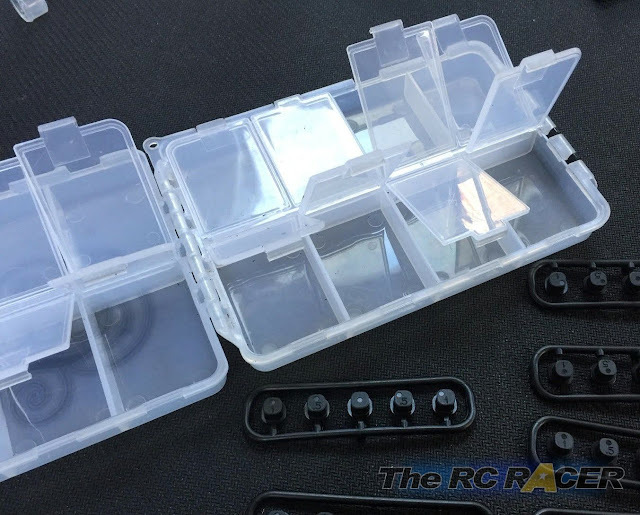 In order to immediately store them correctly, I put all the parts I didn’t use in a plastic storage box. 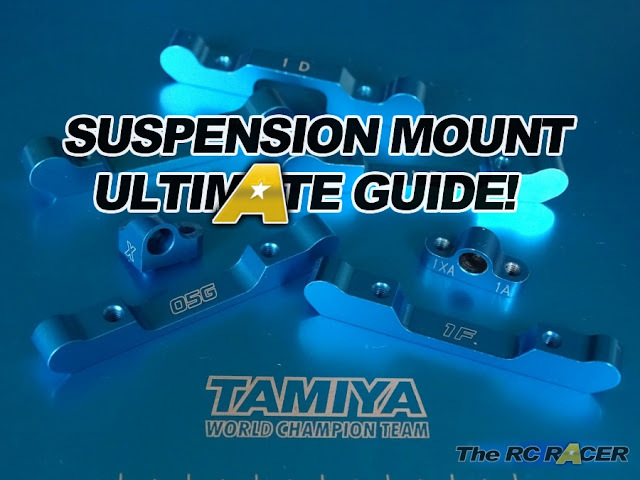 Xray also offers some lower suspension mount blocks as an option. These will lower the roll centre and allow some more steering. 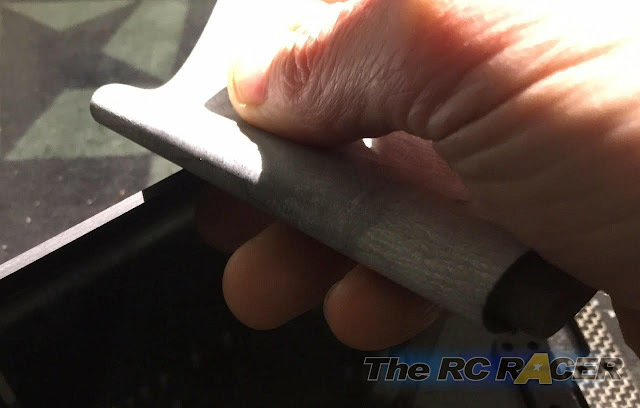 This option is interesting on low-grip surfaces. As we mostly race in these conditions I decided to mount them. In the picture you can see the difference with the normal block and the lower one. Time to get onto the drive shafts. 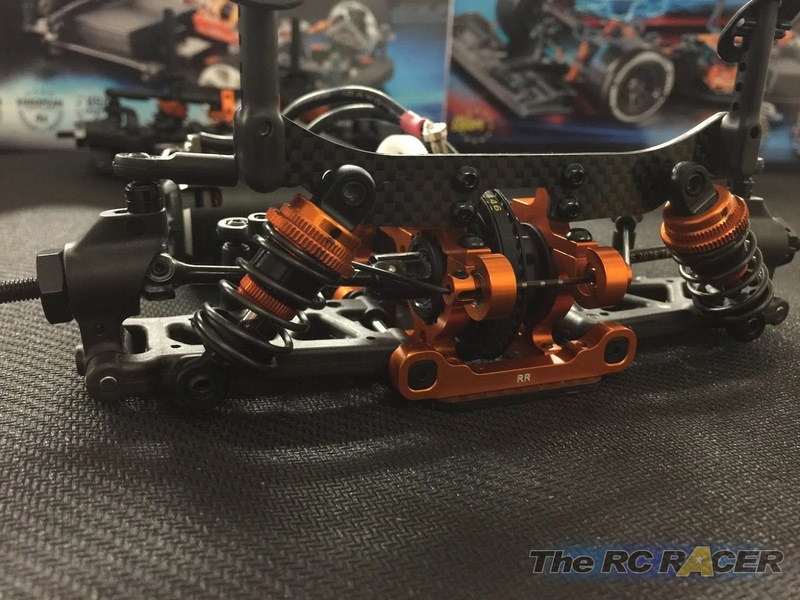 Xray gives a good tip on when to use either the longer or shorter drive shafts in the car. 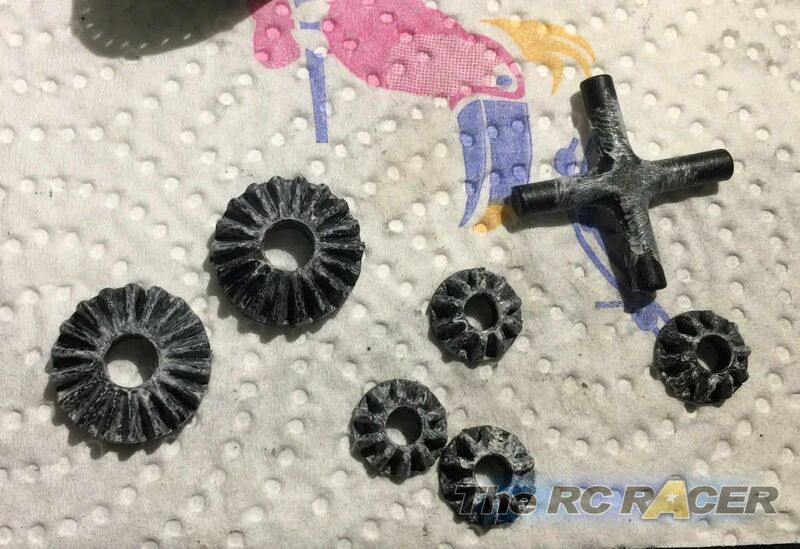 The kit comes with 51mm shafts, which are recommended for carpet tracks and large asphalt tracks. When assembling the shafts, please put some thread lock on the grub screws. 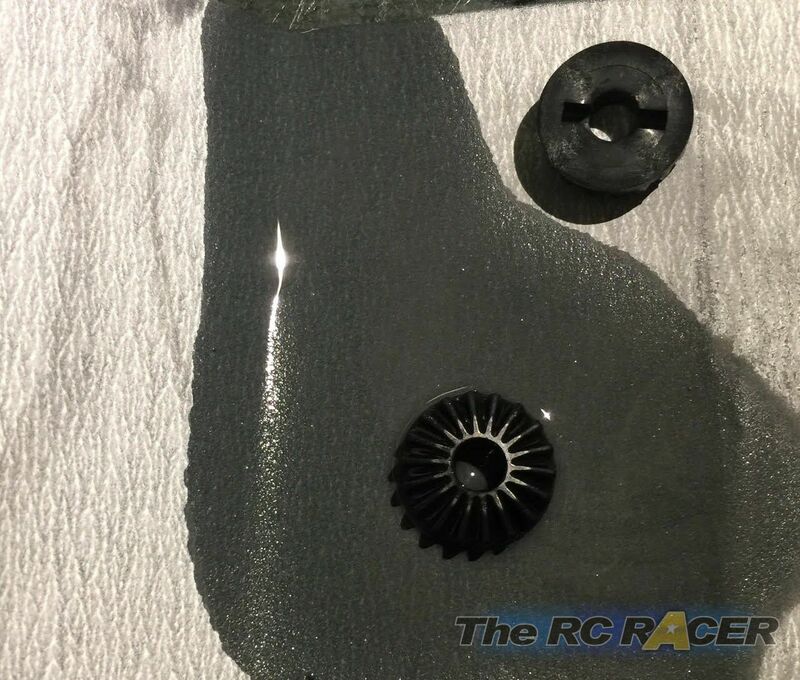 It is stated in the manual, but I didn’t do it (the grub screw came loose in a qualifier, and he had a DNF when it came loose). I installed optional wheel hubs in the rear (-0,75mm) in order to give the car more rotation in the corner. It is however possible that some wheels might not fit with the smaller wheel hubs. The new LRP cpex wheels for instance will touch the rear suspension. Because there isn’t a lot of metal on the side of the wheel hub, I followed Alexander Hagberg’s advice when fastening the wheel hubs. 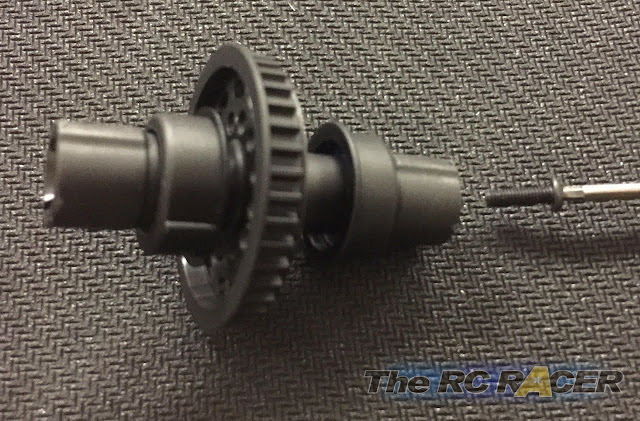 He uses a wheel screw from the setup station when fastening the wheel hub to ensure that you get a decent fit. 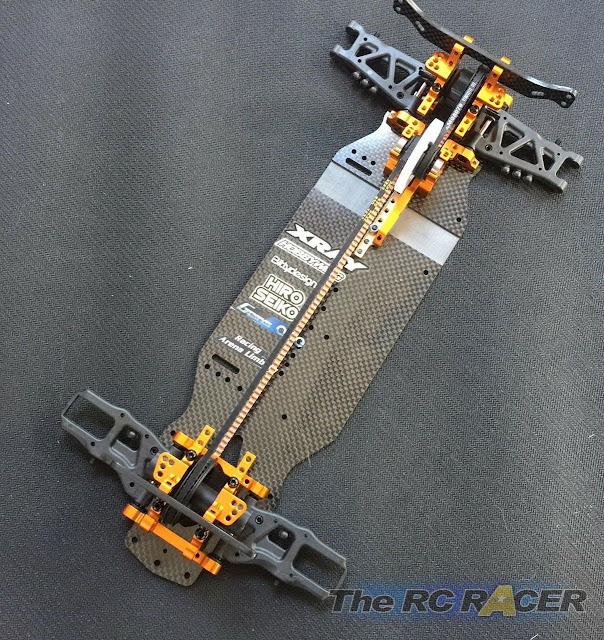 Xray also includes an Active Rear Suspension in the kit. Because it is advised to only use it outdoors, I will review this part in a later article when the outdoor season arrives. One of the things I’m not so fond of is assembling stabilizers. It is always a hassle to make them perfect. Stabilisers only work when cornering, but they are very important once they start to work. It is thus extremely important to set them up correctly. These stabilizers are quite straightforward to assemble. Out of the box, they only need a little bit of fine tuning to make the arms move up and down together. 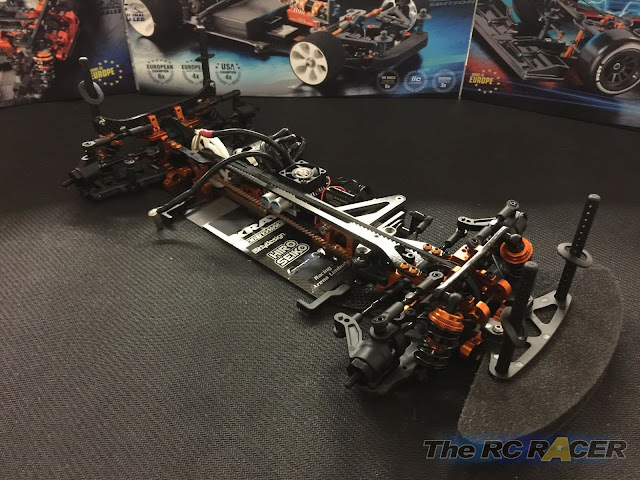 The new Ultra Low Profile (ULP) shocks are one of the biggest improvements in this kit. These shocks, combined with the lower shock towers give the car much more corner speed. 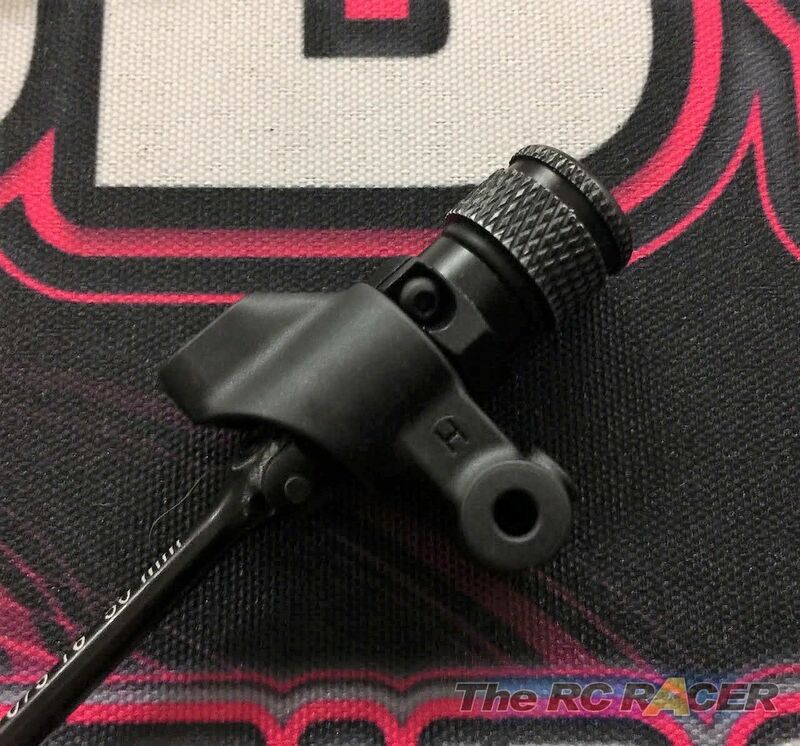 Especially In high grip conditions, this is extremely beneficial. 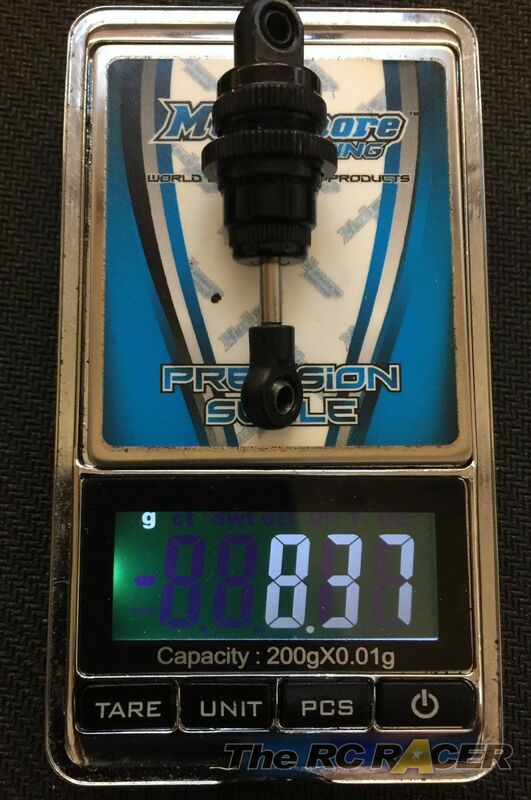 If you take a look at the pictures, you will see that the normal Xray shock weighs in at 8,37 grams. 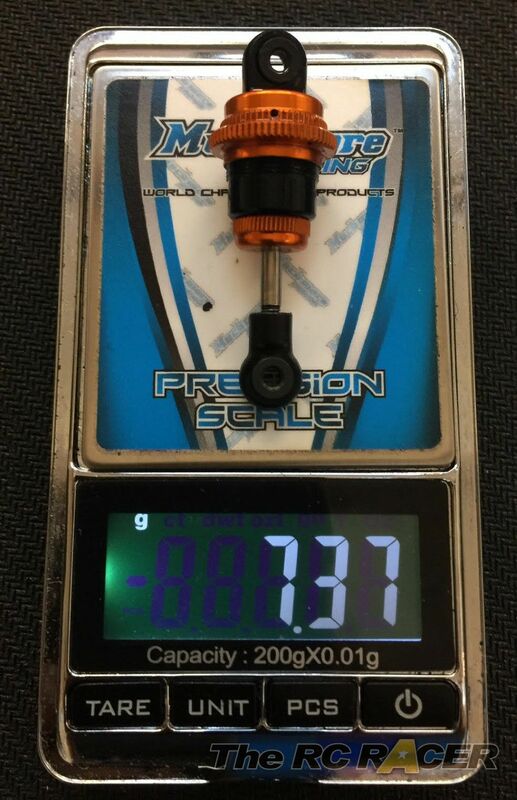 The ULP shock weighs 7,37 grams. Because part of the shock is sprung mass, this weight reduction is very important. 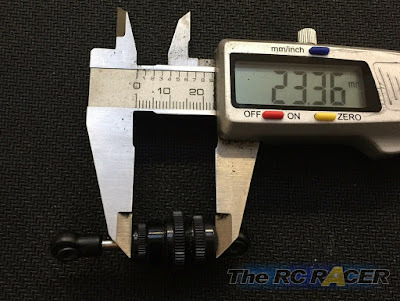 The shock body is also some 3mm smaller than the normal shock, which reduces the center of gravity. Xray was also one of the first manufactures to test the inline flex adjustment. 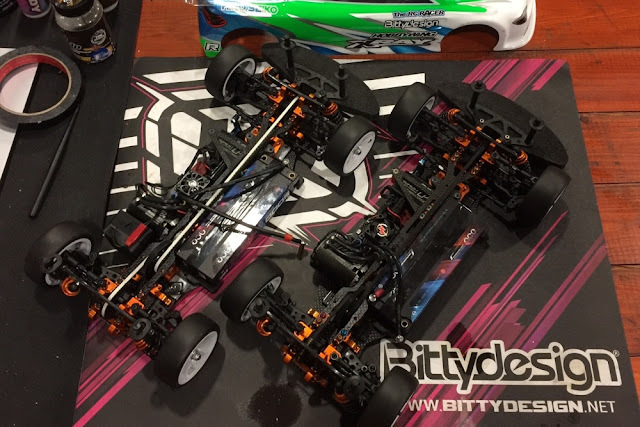 If I recall it correctly, they used it for the first time at the 2016 IFMAR world championship in China, where Bruno Coelho TQ’d the event. 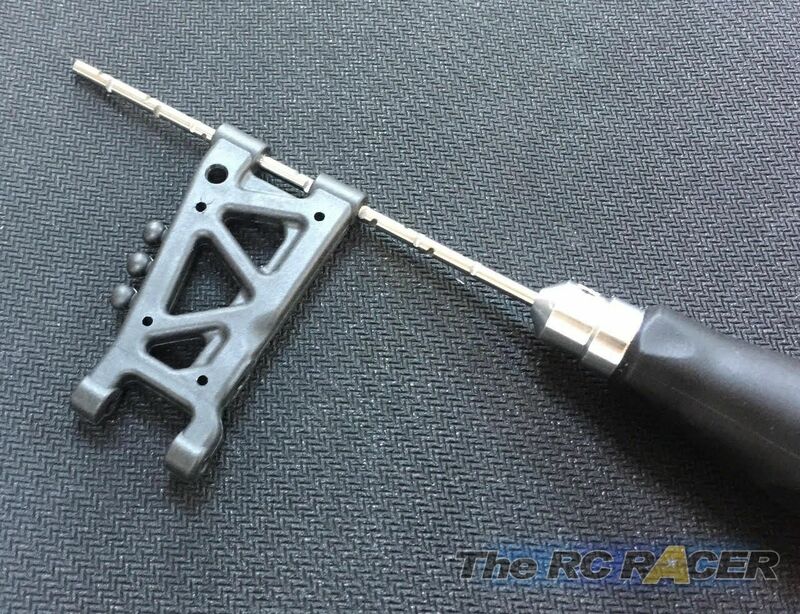 Bruno used the turnbuckle linkage, a similar solution to the one that was also used on the TRF cars by the RC Racer. I mounted the same electronics I always use, a Sanwa RX482 receiver, Hobbywing XR10 Pro Esc and Hobbywing V10 G2 4,5 motor and a Gensace RS 6000Mah battery. There is plenty of space to fit everything and balance the car. Once all the electronics were in place, I set the ride height to 5.0 in the front and 5.2mm in the rear. In order to make my life a bit easier, I used my dremel to make a small marking on the shock ring. This way I can count the number of revolutions to set the ride height exactly the same. Next thing I did was set the camber (2 degrees both front and rear) and the front toe-out (1 degree negative). I always double check the length of the left and right steering turnbuckles to verify that they are even. Once that is done, I adjust the EPA on the transmitter so that the steering throw are the same left and right. Florian was very eager to test his new car, so we set off on an evening to get some laps in. 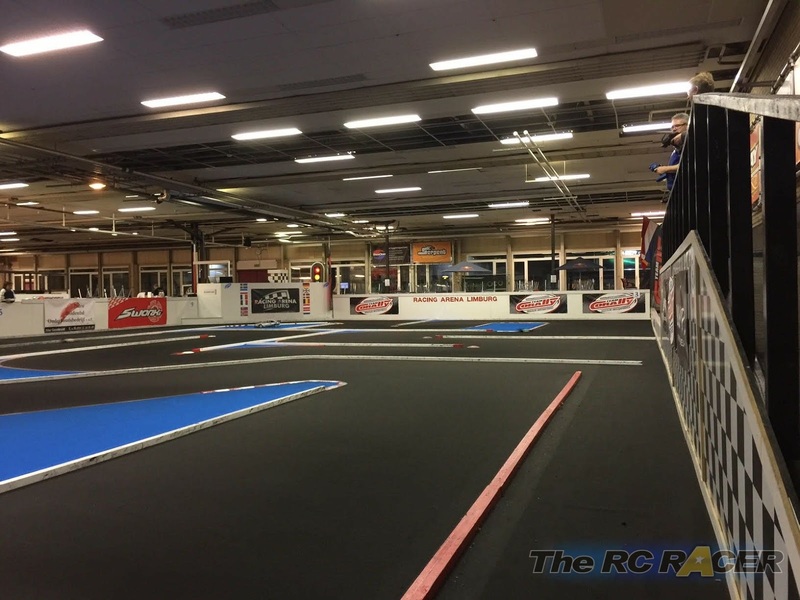 We went to Racing Arena Limburg in Sittard, because it offers the best conditions to test and compare a car. 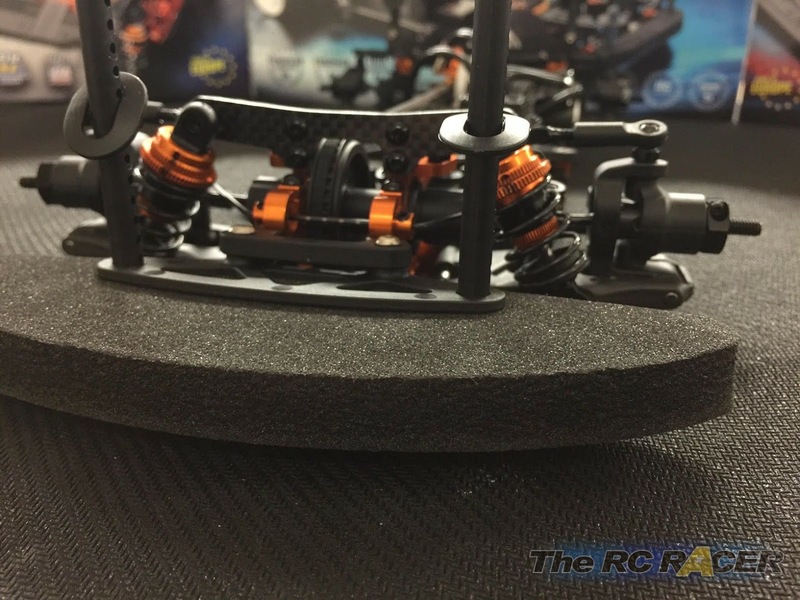 The track is very high grip, so perhaps the setup with the lower front suspension mounts wasn’t ideal. We only did some 120 laps. Because we didn’t have a lot of time, Florian always ran a limited number of laps. 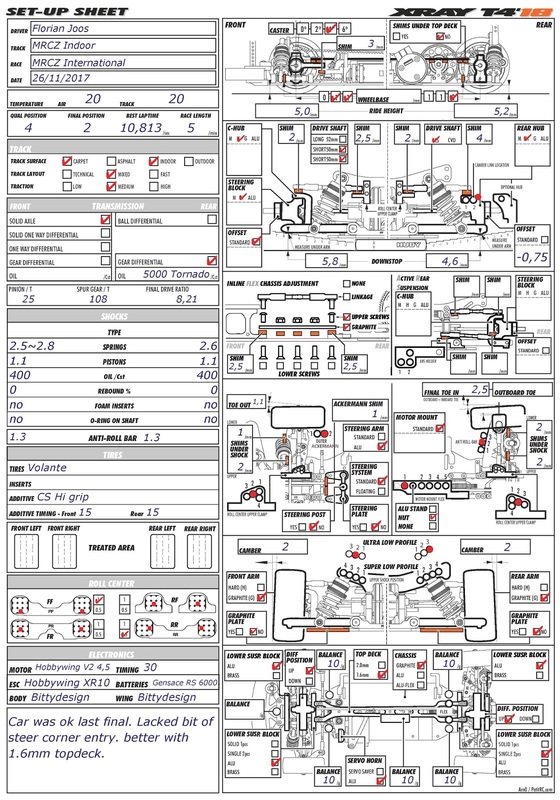 When he came in, I changed a setting on the car, let the electronics cool down and put additive on the tyres. He then reported whether it was an improvement or not, and went back out afterwards. I didn’t do a lot of changes though, as the car was excellent from the start. I changed the position and amount of motor mount screws, swapped out the springs and tweaked the droop. The track was also quite crowded, so it was a bit hard to run consistent lap times. At his penultimate lap, he managed 12.323, which is the fastest lap-time he has ever done so far in modified, so he was a happy camper! 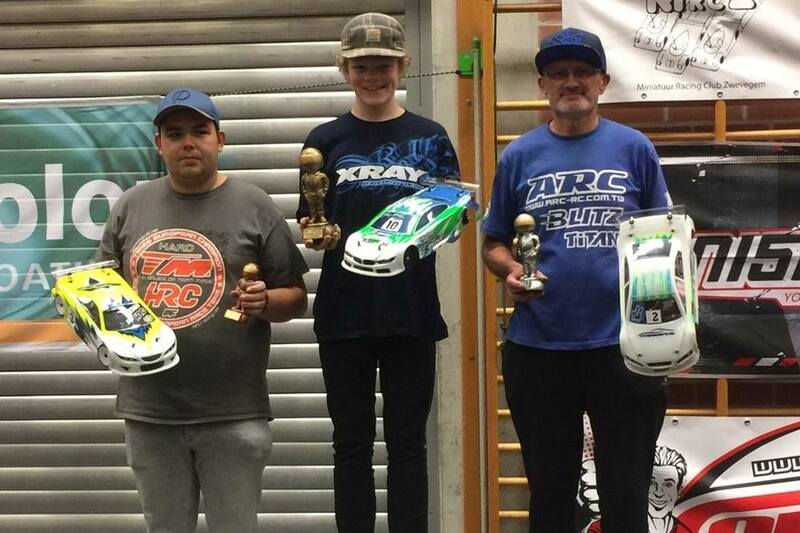 The annual MRCZ Open International race 2017 took place over the weekend of 25 and 26 November in Zwevegem. The event took place in a nice heated hall on which the organisers laid out a track of 20 x 30 meters with brand new ETS carpet. In order to provide maximum grip, the carpet was stuck on the floor with double sided tape. 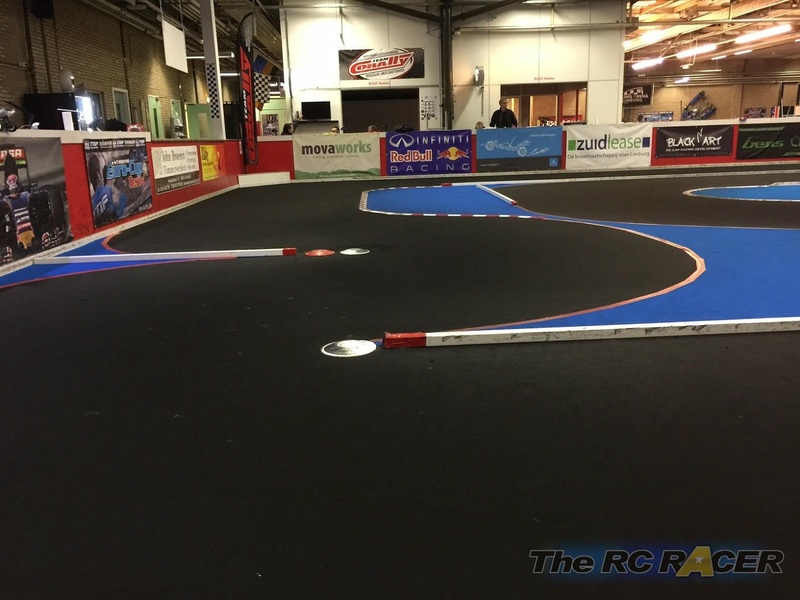 Saturday saw two rounds of free practice followed by 3 rounds of qualifications. On Sunday, two more qualifications (best two out of five would count) and 3 finals were scheduled. This would be the first time Florian would race for RC-Connect, the Benelux Xray importer. Florian was entered in Stock (open 13,5 blinky) and modified. As we had already done a test session with the modified car we felt confident with it, but his stock car was only finished on the Friday before the race, so it hadn’t yet turned a wheel. 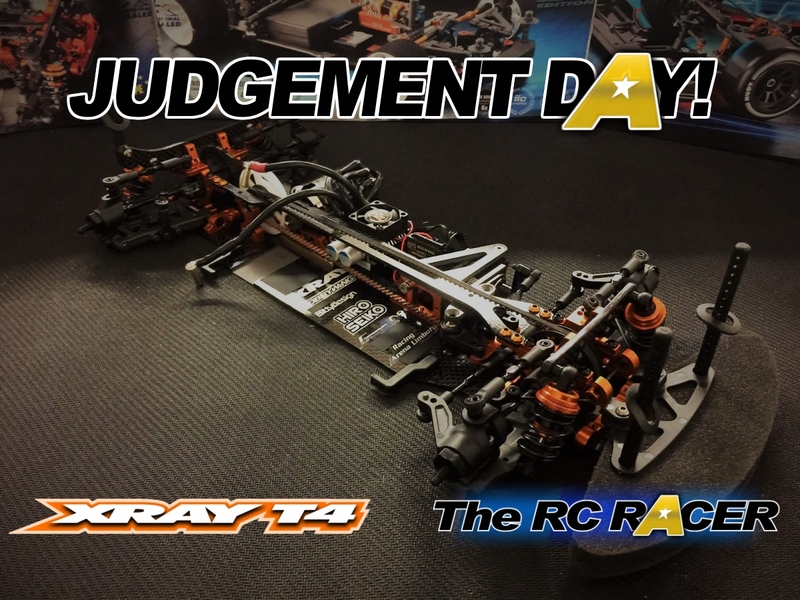 The setup I used was a mix from the box setup , Jan Ratheisky’s ETS setup that I found on the Xray setup pages and my experiences with the T4 modified and previous cars. From the first practice onwards, his car was on rails. Every time he ran he was minimum one lap in front of the second placed driver. 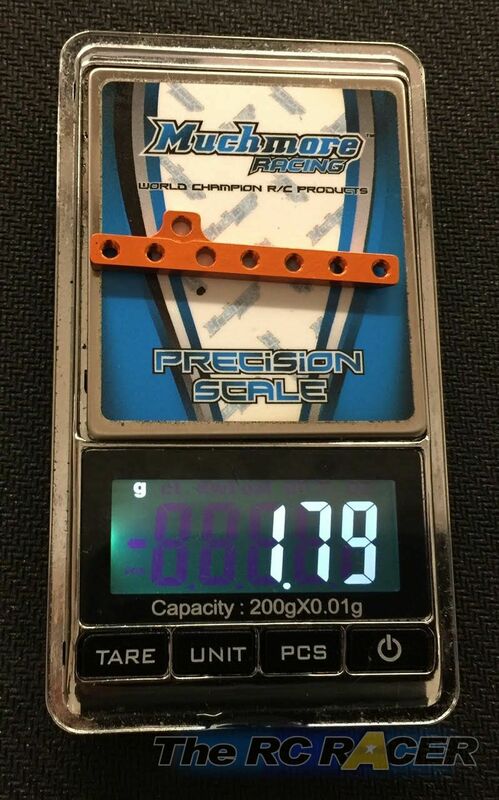 When the grip levels came up for Q1, I adjusted the droop to 5,8mm in the front and 4,6mm in the back. 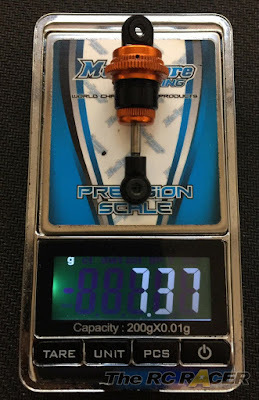 The biggest improvement came in Q2, when I mounted the 1,6mm top deck. His best laptime improved by over .2 seconds. 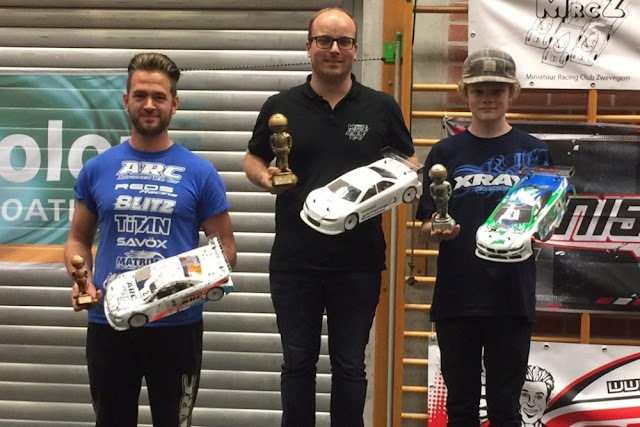 Florian drove well in the the 3 finals and claimed the overall victory. In the third final, I used the 2.0 top deck again to see what difference it made. His car was still very good to drive but just missed that extra bit. His lap time was also marginally slower. In this class, we started running our race tyres (Volante 28) from the first practice onward. Most of the other drivers opted only to use them in the first qualifier. 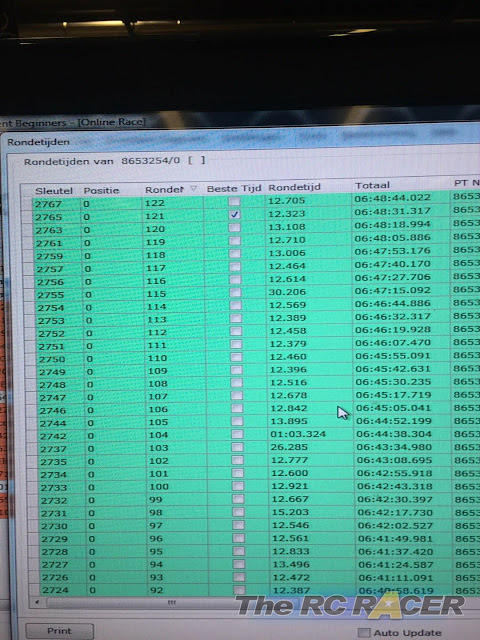 In the first qualifier, Thomas Stockman was the fastest with his Xray and Florian was about 5 seconds behind. In the 2nd and 3rd qualifier the gap increased to almost a lap, despite the fact that the other drivers were using newer tyres. I should have grinded the tyres to make the car more competitive from the beginning, but as this normally isn’t allowed, I didn’t do it. His car suffered from under-steer corner entry, but it was easy to drive. I made a lot of changes in order to get more steering, like shorter wheelbase, stiffer rear spring, more droop in the back, roll centre change. It helped a bit and in Q5 his car was more competitive. In the final qualifier, John Ermen, a former ENS winner, also had refined his set-up and grabbed the fastest time of the day. This meant Florian would start P4, behind Mitchell Van Es, John Ermen and Thomas Stockman. With the final set-up refined, the car was great in the race. Florian won A1 and finished P2 in A2, behind Thomas Stockman. For A3 I reverted to a more conventional setup (the one you see attached) and also installed the 1.6mm upper deck. This made the car faster and better to drive. Unfortunately Florian was wiped out at the start, so he couldn’t fight for the overall victory. That went to Thomas Stockman. 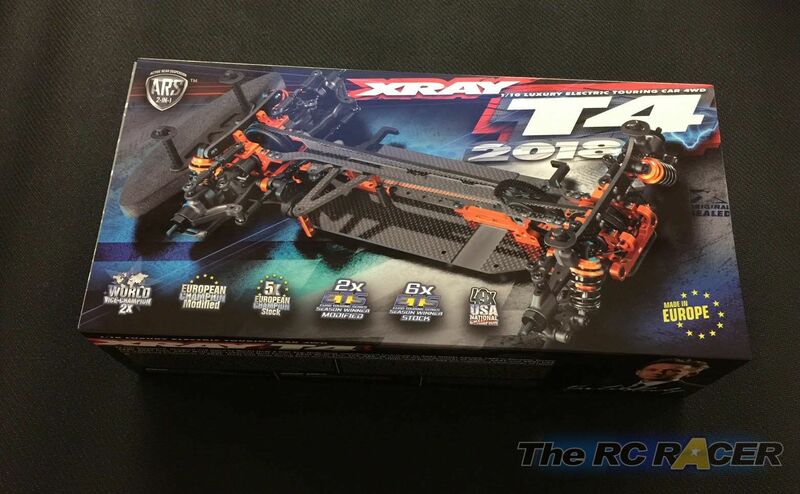 Initial impressions of the XRay T4 chassis are very promising. 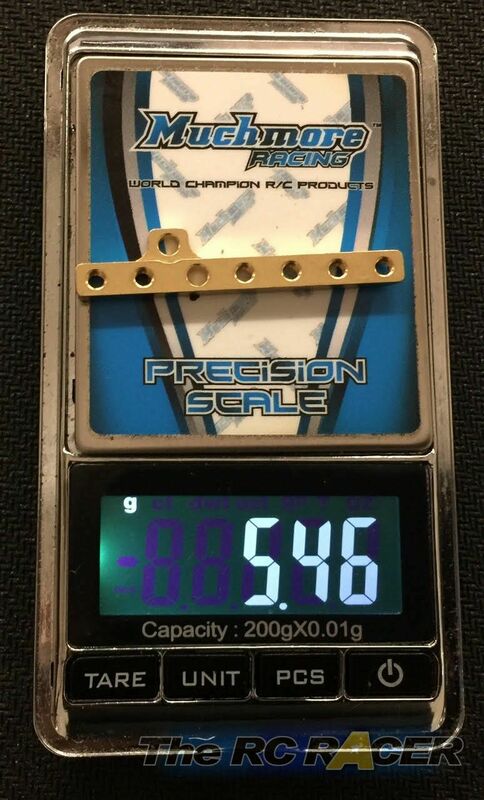 The build quality is exceptional, with the components all being manufactured with high quality materials and the final fit and finish is very precise. 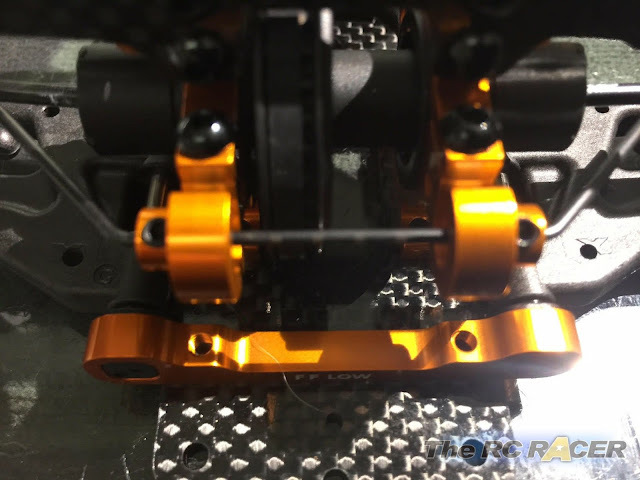 The drivetrain is nice and free and there are a lot of tuning options available to modify the base T4 settings as you try to extract your best lap time. The super low shocks work well on smooth flat surfaces, however until we venture outdoors I will hold judgement on how well they can cope with some of the older more bumpy circuits. Importantly the T4 2018 just seems to work straight out of the box, the car has a lot of grip and is really easy to drive fast, as proven by Florian beating his previous best with this new car. We are really excited to see how the car performs over 2018, so check back for more updates and set-ups as Florian's 2018 Xray season progresses.